This route is also scheduled to be run as a 200K brevet with the first edition being held on September 28, 2013. Most of the roads on the south loop of Yellowstone have been redone in recent years. There's a little bit of shoulder, but riders must always be alert. A rear view mirror is strongly recommended. Watch out for those motorhome mirrors! 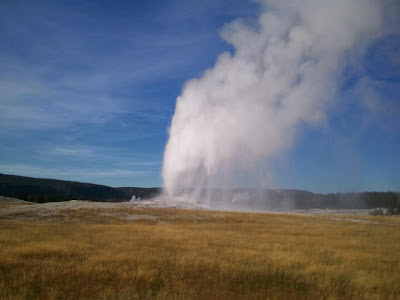 The route goes past some of Yellowstone's greatest attractions, including Old Faithful, Yellowstone Lake, The Grand Canyon of the Yellowstone, and Norris Geyser Basin. There will also likely be lots of wildlife including bison, elk, deer, antelope, and if you're really lucky, a wolf or bear. The route is pretty well serviced, but be mindful of the closing dates of some of the park vendors if doing this ride in the fall. A relatively flat and scenic ride from West Yellowstone to Old Faithful and back in Yellowstone National Park. The ride starts and finishes in Montana, but most of your time will be spent in Wyoming. Grab a bite to eat at the Old Faithful Lodge, watch the geyser go off (if you have time) and then return the way you came. Caution-it's like rush hour right after Old Faithful goes off and Yellowstone traffic is always quite busy in the summer months. The roads are in good shape in this part of the park. For a more relaxing ride, come out in the fall when a lot of the tourists have gone home. This is a nice permanent populaire route, starting and finishing in Belgrade that goes through suburbia, farm land, national forest, and even some urban with a ride through downtown Bozeman. The top feature is the 10 mile climb through Hyalite Canyon-the Bozeman area's most popular cycling route. It's a long steady, but not too hard climb and a fun descent. I've done this route many times and always enjoy it. This site does not support embedded trip maps. View the trip <a href='http://www.trimbleoutdoors.com/ViewTrip/1658439'>here</a> instead. When we last did this route in 2011, I wrote that it featured the best piece of infrastructure in Montana, The Bitterroot Bicycle Trail. Well since then, the trail has gotten even better. It has been extended all the way to Hamilton. So I modified the 2011 route to stay on the trail instead of using the highway on the east side of the Bitterroot River. 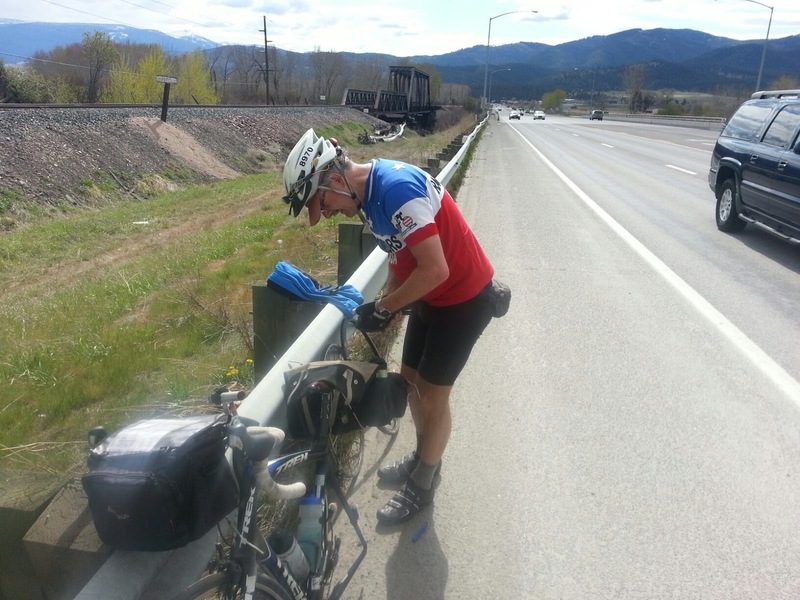 The result was over 70 miles of bike path riding, and not having to deal with intolerant Ravalli County drivers-who proved in 2011 to be pretty hostile. Karel Stroethoff and I were honored to be joined by Mike Biggle from Great Falls on a breezy chilly morning in Missoula. We set out at 7AM and were blessed with a nice tailwind to Frenchtown. Then we made our way across the Missoula Valley in heavier than usual traffic. Something was going on. Eventually we came across the staging area for some sort of huge running event. There were people everywhere. The traffic remained heavy for a few miles, but most were going the opposite way and didn't cause us any problems. We eventually joined the aforementioned Bitterroot Bicycle Trail in Lolo and flew to Hamilton with a 15 mph wind at our backs. Our first 100K was done in just over 4 hours and life was easy. Unfortunately, we had to return from were we came and the ally wind was now our adversary for the next 40 or so miles. Mike spun on ahead, the wind causing him little resistance while Karel and I chugged along behind. 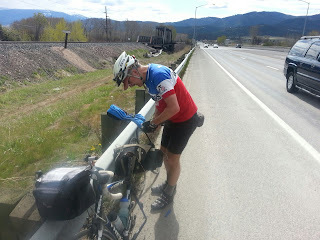 Karel got a flat right at the Missoula city limits sign when he ran over a staple, but he had it changed in short order and we cruised through residential Missoula and the University of Montana to the finish. The weather forecast called for highs in the mid-60's, but I don't think we reached that until about 10 miles from being done. I kept my arm and leg warmers on the whole way. But it wasn't a bad day, considering the awful spring weather we've been having. The 15 mph winds were a mere breeze compared to the record setting gales from last weekend. 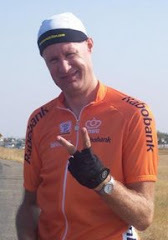 So it was a successful 200K and a good start to the brevet season. Congrats to Mike for completing his first randonneuring event in fine fashion-I'm so happy to have another Montana randonneur in the fold. Our next one, the 300K, is June 15 out of Belgrade. Should be fun!